What if humans had to assume the pollination responsibilities of honeybees? Honeybees provide pollination for over 90 crops or one third of our food supply. Their pollination services are worth an estimated 15 billion dollars per year. Since 2006, honeybees have been mysteriously disappearing. This phenomenon is known as colony collapse disorder. To draw attention to the human reliance on honeybee pollination, I created satirical hand pollination toolkits. 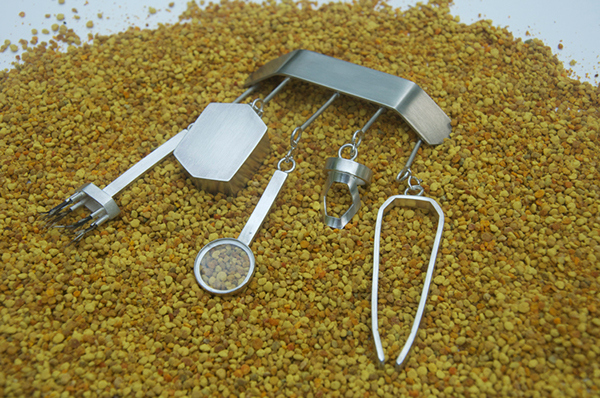 With these hand pollination toolsets, one doesn’t have to sacrifice fashion for function. 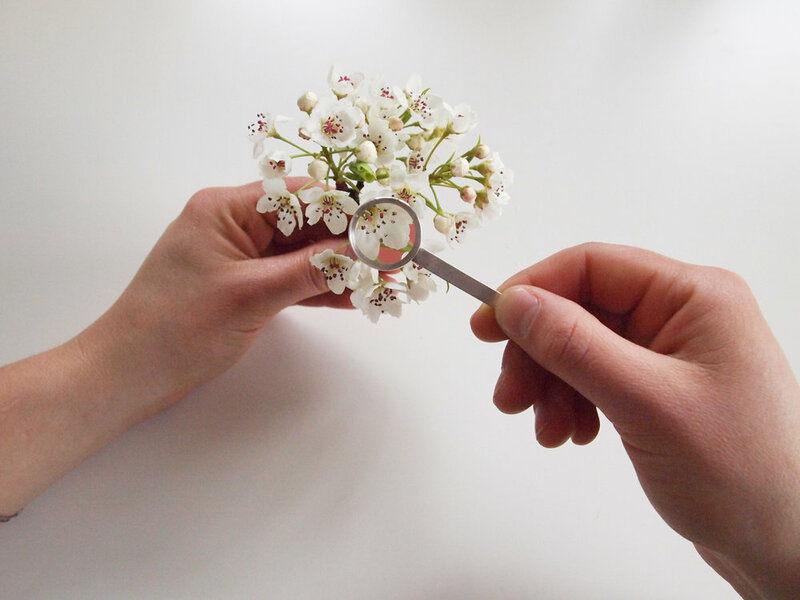 This 10x magnifier allows you to get up close and personal with the blossom’s anatomy to distinguish the anther, the pollen baring part of the blossom. 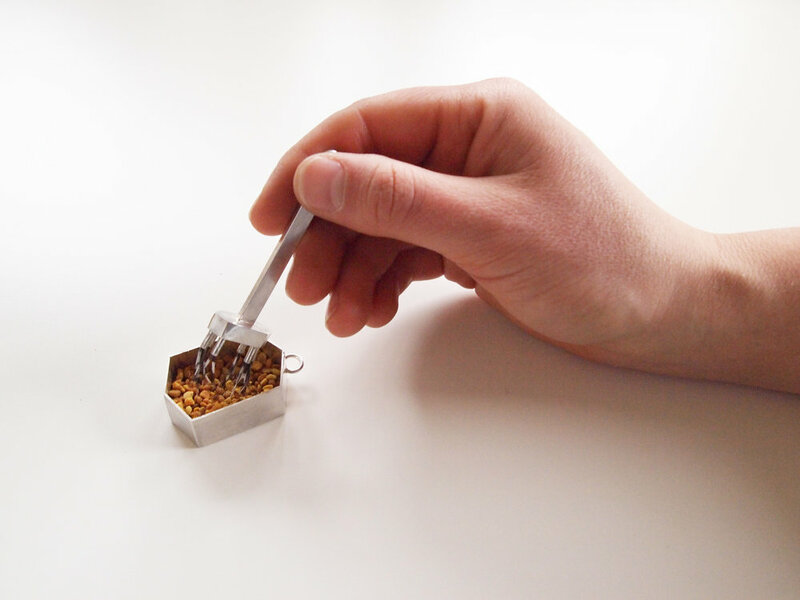 Anther removal has never been easier with these utilitarian tweezers. The perfectly aligned tips are sure to pluck even the most uncooperative of anthers with precision. 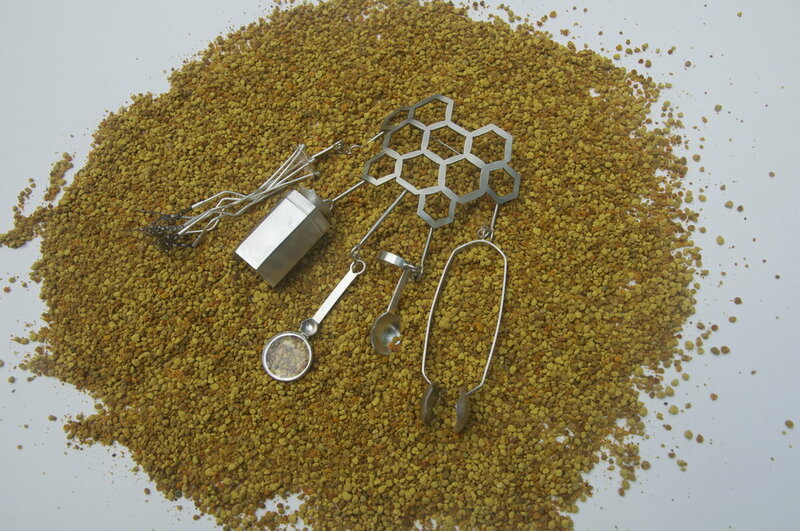 This finger scraper utilizes the mobility of the fingertip and allows for efficient pollen removal. We guarantee you won't miss a spore! You can rest assured that collected anthers and pollen will stay fresh in this airtight container. Boasting six pollinating arms, the applicator mimics the fuzzy body of the bee allowing you to distribute pollen evenly over blossoms. 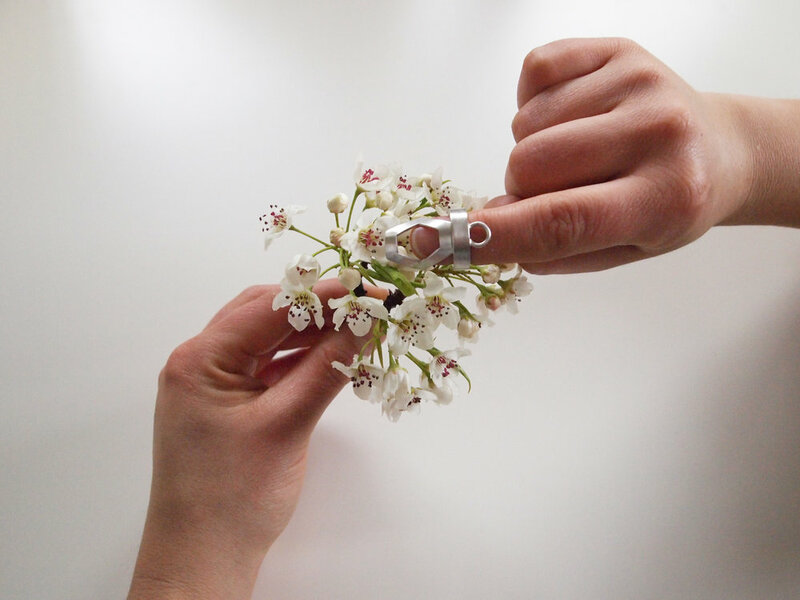 In just five steps, you too can pollinate a single blossom. We think you’ll love being a bee. This project has been shown at Palazzo delle Esposizioni in Rome (2018), ArtScience Museum in Singapore (2017), CCCB in Barcelona (2015), and at Science Gallery in Dublin (2011). You can watch a video about the piece from Science Gallery Dublin in 2011. By adorning one’s self with a hand pollination tool kit, the wearer would find themselves in an uncomfortable and overwhelming position. The wearer is forced to imagine assuming the vast and tedious pollination responsibilities of the honeybee. Use is intended to provoke questions about the social and environmental implications of colony collapse disorder.